The Artists Village had never quite been pinned to a specific style or agenda. The recent group show might just endorse this view. It might disappoint the ardent art buff because it resembles a degree show in terms of scale, derivative ideas, style, taste, artistic methodology, media or technical completeness. In contrast to that, a fan of the Artists Village might be intrigued by the fluidity, flux of new ideas and media, and how these interlace and influence contemporary artists living and working in Singapore. The Artists Village is perhaps one of the best cases to understand Singapore Art and the ground issues faced by practitioners in Singapore. With sufficient grit, a would-be Singapore Art historian might find enough material to write a substantive tome from the Artists Village archives to shed light on individuals, and collectives that operate loosely within Singapore’s contexts. Yet this phoenix-like organisation also has the historical burden to constantly surprise and continue to make history. Like any other organisations in the 21st century, not just art groups, the Artists Village faces challenges from within and outside: Evolving leadership and membership; issues of competition, support, relevancy, and obsolesce in the face of new media. The motivation behind the exhibition began with the inward thinking, exploration and interpretations of the word ‘show’. This could have been further exploited if the exhibition’s title, site, display and texts could have been pushed further. Not in the gimmicky sense, but in a thoughtful and meaningful manner. The exhibition title might be described as lacklustre, just the same it sums up what the show is about. The curatorial slant might have stirred more dialogue and debate if it did engage with notions about and surrounding degree shows and how they relate to the ‘art world’. It might be the lack of lead-time, or remiss of communication between the curators and artists, the curatorial dimension failed to resonate the potential dialogue between the artists and artworks, or harness the power of collectives or utilise the art institution site to its full potential. The use of wall texts would then play a more important role to highlight the curatorial intent, supporting the individual artist’s intent or collective statement, perhaps. In sum, the show might best be described as varied, not in the miscellaneous sense, but in a misdirected sense. Having typed that, it doesn’t mean that individual works failed to deliver the brief. Notably, Cheng Guangfeng’s Show tune: irritability (2013) is quite a buzz. It nails what the art world might appear to the uninitiated, or how art, or beauty, is to the eye of the beholder. An unassuming wooden box sits on a plinth, an irritable familiar fly buzzing sound emanates from the box. 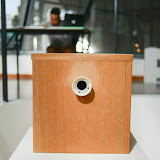 The box resembles both a prototype speaker, a humble means to transmit a sound, tune or voice. The box also resembles a light bulb holder, ready to be used as a prop for something perfectly banal and ordinary. Instead of just seeing the artwork, the viewer has to make sense of all this through hearing and quite bit of imagination and interpretation. As I write this, I am humbled by Chen’s artwork again. The ambiguity and simplicity of the work truly invites us to ponder what the arts are all about, and why they must be experienced in person then merely reading about it. The arts have the potential to inspire, inform, educate and in some instances entertain. Besides depending on the curator and artists to do all these, and surely not equally on all fronts, the viewer can take pride and initiative to make meaning too. Institute of Contemporary Arts Singapore (ICAS) (specifically Project Space and Praxis Space, Blocks G and H, Level 1, G101, H101) LASALLE College of the Arts. 28 Nov – 10 Dec 2013. FOST gallery has surfaced an interesting collection of images, which avid art purveyors will find familiar. Yet they are distinctively timeless, aided by the classical medium of black and white photography. Envisioned by American photographer Rodney Smith, these images depict neatly fashioned gentlemen (and women) in interesting settings, suggesting a homage to, or sharing a fascination of men in suits and bowler hats with Surrealist Rene Magritte. The exhibition title is contradictory or enigmatic, depending on the manner it is decrypted. On one hand, the exhibition title could describe bizarre, real life events. On the other hand, it could characterise a visual treat — blurring of fantasies and the real world; tricking the mind to make up a story behind the image, pushing absurdities in composition, fictitious narrative and pictorial perspectives; shifting an event or item out of the ordinary to give visual pleasure to the image maker and viewer. Photography in this time and age is democratised to the extent that anyone can be a photographer. But not everyone can take timeless, memorable photographs, transcending personal memories to evoke powerful narratives or messages. While anyone can learn to compose an image formalistically, paying attention to rule of thirds, rhythm or proportion, not everyone can relentlessly pursue an artistic vision. The photographs by Rodney Smith is a case in point of a remarkable artistic vision, and I suspect he is unable to take haphazardly composed holiday snapshots. The black and white photographs might appear cliche or overtly nostalgic to some viewers. But their reservations should not detract from the artist’s valid treatment, using monochrome to draw attention to the picture’s subject matter, ensuring that the composition is undisturbed by colours. Monochrome photography is not obsolete or dead; it remains an alternative means to make an image that is equally telling. Photography is a medium that is both comfortable as a framed print, or as pages in a book form. This works if tightly supervised by the photographer, evident in this exhibition: the size, proportion, tones, density of blacks, luminosity of whites in a print are all taken gravely. 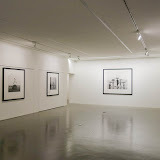 This exhibition features framed and signed edition-photographs. It also features a hardcover copy of The End (2010), a limited edition collection of choreographed photographs of “city life, holiday escapades, italian gardens, and posh sports”. From this weighty, summative tome, the meticulous, yet surreptitious working methodology of the artist is revealed. Using natural light, mostly black and white film,each image is carefully composed. Each photograph is never cropped. They are also hand printed on silver-gelatin photographic paper, or embracing the digital printing process, reproduced perfectly with archival pigment and paper. Each location is painstakingly scouted likely a movie location scout, taking up the bulk of the creative process. Yet the image is never pre-determined: the eventual scene the result of a dialogue between the photographer, the model and the location. Yet the description above over simplifies the photographer’s uncompromising, visionary merits or his resolute adventuring to make a photographic image. There is a Peter Pan-like playfulness, an admirable unyielding spirit of photography that gives these images its gestalt decisive moment. Perhaps it is this playful spirit we so envy that makes the images stick out, collectively, transcending stock image libraries and wedding photography albums, into the realm of fine art. In the spirit of Neverland, perhaps the sole enduring message the photographer wants to convey is “we only live once”. The title of this exhibition can be read in two ways. First, literally, referring to the myriad Anime characters that have gain popularity in Japan and elsewhere. Second, referring to the intangible attributes, or “the mental and moral qualities distinctive to an individual”, of Japan a country steeped in respect for traditions and heritage and technological advances. The anime that Singaporeans are fond of is perhaps tied to the mystique surrounding the land of the rising sun and allure of the country’s soft culture and sub-culture. 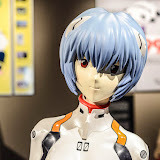 The exhibition features several iconic Anime avatars such as Rei Ayanami (Neon Genesis Evangelion) Ultraman, Gundam, and Pokemon. Accompanying these theme park like mannequins/sculptures are visual panels, text and extracted video clips showing how these Japanese characters have become emblems of ‘kawaii’ (cute) consumerism. The most informative panels shows different characters in the past decades (e.g. 1950s-1960s, 1970s, 1980s, 2000s) and corresponding economic, social or technological milestones in the history of Japan. Fans of Spirited Away (2001) or My Neighbour Totoro (1988) might be disappointed that characters from Studio Ghibli are not represented. This exhibition shows just the tip of the iceberg, featuring Anime and Manga as Japan’s cultural exports, soft power, or cultural diplomacy. Thoughtful and serious themes and subject matter portrayed explicitly or implicitly in Anime are not discussed. Neither is this meant as a critique of Japan’s exploding subcultures, like Little Boy (2005) series of exhibitions curated by Takashi Murakami. While the informed audience might had wished for serious interpretations of these Japanese characters, the casual audience would be quite happy taking photos with their human size idols. For a brief analysis of the cultural status, popularity and dilemma of Anime as pop culture, see Saito Kenji’s “More Animated than Life” here.